Legal questions surrounding a couple of witnesses kept the prosecution from wrapping up their case in the Cal Harris trial Tuesday. The prosecution brought up concerns about a previous witness, Gregory Farr. Farr testified that, while in prison, he overheard Harris admit to killing his wife. In the middle of his testimony, he pleaded the Fifth Amendment. Prosecutors say that's because Farr's family received a threatening phone call from the defense's private investigator. The defense, however, says the call was only meant to gather information for their cross-examination. There were also questions of whether or not testimony from Cal Harris' sister-in-law given in his last trial could be read in court. She recently underwent surgery, and a Florida judge ruled she didn't need to return to New York to testify. But the defense says it wants her to appear because it would question her differently this time, since there's no jury. The judge is expected to decide on both issues Wednesday. Testimony by a new witness — a convicted murderer — in the Cal Harris murder trial was stricken Tuesday after he refused to answer questions about the Spencer man's alleged jailhouse confession. 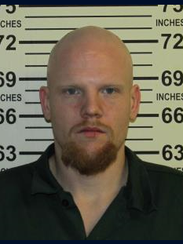 Gregory Farr, 26, is serving 19 years to life for a 2011 murder in Cattaraugus County. Prosecutors say Farr overheard Cal Harris make an incriminating statement to another inmate while they were in prison in Auburn, following Harris' second conviction in 2009. After Farr testified about the threat Friday in Cal Harris' fourth trial, the defense argued Farr only notified the Tioga County District Attorney's Office about it in 2011 so he could gain a lesser sentence for himself. As the trial entered its 11th day of testimony Tuesday, Farr was once again escorted into court by corrections officers and took the stand — but this time he invoked his Fifth Amendment right against self-incrimination. "Under the advisement of counsel, I'm not going to answer any more questions," Farr said in court Tuesday. Judge Richard Mott, who will decide the verdict in this trial, then ordered Farr's entire testimony stricken, meaning it will not be used in this case. Schoharie, NY (WBNG Binghamton) A witness in the fourth Cal Harris murder trial has recanted his testimony after his family received a call from an investigator with Harris' defense team. The prosecution on Tuesday introduced a phone recording between 25-year-old Gregory Farr and his mother. On Friday, April 16, Farr said he overheard Harris threatening another inmate while the two were in prison together in October 2011. Farr told the judge he heard Harris shout: "I'll make you disappear just like I did my wife." After Farr testified on Friday, he called his mother the following Sunday. During the call, Farr's mother told him an investigator hired by the defense called their home several times. According to the defense, the investigator spoke with Farr's father, grandfather and mother. When Farr spoke with his mom, she asked him what he was doing testifying in the Harris case. He said he couldn't speak about the matter because he was still under oath. Farr's mother told him "an investigator says you'll be in a heap of trouble." She said the investigator had evidence showing Farr had a history of lying. On Tuesday, and as things were moving along nicely, the Calvin Harris second-degree murder trial stalled pending what will now be a hearing to determine whether or not a witness was persuaded by the defense to discontinue testifying. On Tuesday morning, the prosecution introduced a voice recording of a conversation that took place between 25-year old Gregory Farr and his mother. Two of Cal Harris' children took the stand as the defense begins to lay out its case. Harris' daughter Jenna and son Taylor both testified about life with their father after their mother disappeared. They contradicted testimony from prosecution witnesses, saying they never remember Harris taking down pictures of their mother. Jenna also testified her father kept her mother's dress and other items from their wedding. She said he also created photo albums for all the children that included pictures of Michele. On cross-examination, Taylor was questioned about a comment he allegedly made as a child. The DA says the kids' babysitter claims that, shortly after Michele disappeared, Taylor asked his father why he wasn't in bed overnight that night. But Taylor testified he doesn't remember saying that. The defense plans to call about a dozen witnesses to the stand. Testimony will resume Thursday morning. The judge sided with the prosecution when it came to Francine Harris. Cal Harris' sister-in-law recently underwent surgery in Florida and was unable to travel. The judge allowed her testimony from Harris' third trial to be read into the record. The judge then moves on to Francine Harris testimony. He says he believes the district attorney did due diligence to get her here to testify. Schoharie, NY (WBNG Binghamton) Two important witnesses for the defense have been avoiding testifying in the fourth Cal Harris murder trial. Harris' attorneys have yet to track down former New York State Police Investigator Robert DelGiorno. They asked the prosecution Thursday for help locating him, stating that the address the prosecution previously gave them is not correct. DelGiorno is believed to be in Florida. He successfully avoided testifying in the third Cal Harris murder trial as well. Judge Richard Mott said he is willing to sign an order to force DelGiorno appear if he does not come forward. Stacey Stewart, a Texas man who was friends with Michele Harris before her disappearance, has yet to respond to his subpoena to testify. He is believed to be in Arkansas. The blood stain expert for the defense was called give testimony Thursday. Terry Laber, a private forensic consultant, testified for the defense in the third Cal Harris murder trial. Schoharie, NY (WBNG Binghamton) A major new development took center stage during Friday’s testimony in the Cal Harris murder trial. Harris is accused of killing his wife, Michele, but her body has never been found. Cal Harris’ attorneys are trying to prove two men were co-conspirators in Michele’s death. The defense said Friday that it believes Stacey Stewart and Chris Thomasan are responsible. The two are from Texas and were working in Waverly when Michele Harris disappeared in September 2001. On Friday, Julie Brinkman, a former co-worker of Stacey Stewart testified in January of 2015 Stewart told her he “was the last one to see Michele alive.” The two were alone at Stewart’s home. Brinkman also stated Stewart bragged about knowing how to hide a body and that he had killed someone before. The fifth week of the Cal Harris trial is now underway. The trial left off on Friday with Harris' defense team in the middle of its case. They are now pointing the blame at two other men, Stacy Stewart and Chris Thomason. They say they would like for Stewart to testify, but are having issues tracking him down. The defense's blood stain analyst is also expected to continue testifying this week. Kevin Tubbs, whose testimony led a judge to overturn Cal Harris' first murder conviction, took the stand Tuesday in the fourth trial for the Spencer man accused of killing Michele Harris. Tubbs delivered defense testimony he has previously given to two juries: that he saw a woman who resembled Michele Harris at the foot of her driveway arguing with a man in his 20s just before 6 a.m. on Sept. 12, 2001. That's hours after prosecutors say Cal Harris murdered his estranged wife, then 35, and disposed of her body. Tubbs, who lived in Candor in 2001, testified he followed his normal farm work routine the morning of Sept. 12 that year, waking around 4:30 a.m., and drove 20 minutes to a nearby Tioga County farm. That would put the time shortly after 5 a.m., he said. He loaded hay onto a pickup truck with a wagon, he testified, a task that took him little more than a half-hour to complete. By 5:45 a.m., Tubbs said, he was driving past the Harris home on Hagadorn Hill Road in Spencer. He said he saw a pickup truck and an SUV at the end of the driveway and a woman who seemed to be upset was talking to a dark-haired man who appeared to be in his 20s. "It appeared to be Michele Harris; I didn't know her well," Tubbs testified Tuesday. "But she was a blond woman who looked similar." Schoharie, NY (WBNG Binghamton) A key witness for the defense in the fourth Cal Harris murder trial testified in Schoharie Supreme Court. Kevin Tubbs is a farmer who frequently traveled by the Harris home. Tubbs testified Tuesday that he saw a blonde woman and a young muscular man standing near a black pickup truck at the end of the Harris' driveway on September 12, 2001. Tubbs said he was hauling a large load of hay and said the blonde woman he saw seemed upset. He believes that it was Michele Harris -- but said Tuesday "I cannot swear that it was her." Tubbs said the man with her was Stacey Stewart, a man from Texas the defense believes is responsible for Michele's disappearance. Tubbs didn't tell anyone about that morning until June 7, 2007 -- the day Cal Harris was first convicted of murder. Broome County Judge Joseph Cawley also took the stand Tuesday to explain his role in the first Cal Harris murder trial. He was a private defense attorney at the time and represented Harris. Cawley said on June 7, 2007 -- The day Cal Harris was first convicted of murder -- his office received a call at around 11 a.m.
Kevin Tubbs called Cawley's office and said he saw a woman matching Michele Harris' description on the morning of September 12, 2001. Harris had been convicted at 9 a.m. that day. A former attorney in Cal and Michele Harris' divorce proceeding testified Wednesday in Cal Harris' murder trial that a settlement was being negotiated and a trial was up to a year away when the mother of four disappeared on Sept. 11, 2001. Those details, the defense says, deal a critical blow to the prosecution's alleged motive — that Cal Harris murdered his wife to regain control as personal and financial pressures mounted in the divorce case that was bound to go before a judge. Retired attorney Stanton Drazen represented Cal Harris in the divorce and scheduled a trial for October 2001, and his testimony centered on Cal Harris' perception of the status of his divorce proceeding. "What's going on in the defendant's mind — that's relevant," Mott said. Drazen's testimony bolstered arguments defense teams raised in Cal Harris' third and fourth trials. A bra strap, pieces of fabric and other items recovered by a forensic anthropologist's team from a burn pit on a rural Tioga County property could prove Cal Harris' innocence by implicating a man who lived there in 2001, defense attorneys said Thursday. Dr. Dennis Dirkmaat, a forensic anthropologist from Mercyhurst University in Pennsylvania, testified in Schoharie County Court about the items his team took in January from the burn pit. Judge Richard Mott will decide whether Cal Harris is guilty of killing his wife, Michele Harris, on Sept. 11, 2001. A team of nine college students used a screen to sift through clumps of dirt to identify the items, which were placed in bags as potential evidence, Dirkmaat testified. Other items found included a corroded clasp and a knife blade, he said. Defense lawyers for Cal Harris contend the bra strap and fabric belonged to Michele Harris. They say the fabric matches the light and dark colors of the waitress uniform from the Waverly restaurant she was working at in 2001. Although discussed at length by Dr. Dennis Dirkmaat, items found at a burnpit where not admitted into evidence. After the prosecution questioned the chain of evidence, Bruce Barket said he will call Binghamton University student involved in the dig at the burnpit. Former state police investigator Leslie Hyman also testified this afternoon, focusing on the investigation into Cal Harris from the very beginning. Hyman had some investigators hide in camo and gilly suits to videotape the property. What do you think? Should the judge let this "new" evidence in? The burn pit is circumstantial evidence that, according to the defense, ties a man named Stacey Stewart to Michele's disappearance. The defense's contention is that Stewart was the last person who saw Michele alive. The defense is also suggesting that Stewart and another man were involved in the alleged murder of Michele Harris and some of their witnesses have testified to that effect. The prosecution presumes that Michele is dead because there have not been signs of activity that might suggest that she was alive after her car was found at the end of her home's driveway on September 11, 2001 when she went missing. There is also the bloodstains evidence. The judge might allow the burn pit evidence because it supports the defense's alternative theory to the prosecution's argument that it was their client who murdered her because of their impending divorce. Of course, one can never be sure of what a judge might (or might not) do. "The burn pit — about seven miles from the Harris home in Spencer — is on property previously owned by Stacey Stewart, a Texas resident and former steel worker who was living there in 2001. Defense lawyers contend Stewart, along with another Texas resident who was working in Tioga County at the time, Christopher Thomason, were responsible for the murder instead of Cal Harris." "On Friday, Julie Brinkman, a former co-worker of Stacey Stewart testified in January of 2015 Stewart told her he “was the last one to see Michele alive.” The two were alone at Stewart’s home. Brinkman also stated Stewart bragged about knowing how to hide a body and that he had killed someone before. What would be their interest or motive in killing her? @Freckles: I found your above comment quite interesting, nothing surprises me anymore. We write to request permission to introduce evidence that Cal Harris is innocent by introducing evidence that Michele Harris was murdered by Stacey Stewart and Christopher Thomason. Fundamental to a defendant’s right to a fair trial is the right to present a defense. See Crane v. Kentucky, 476 U.S. 683, 690 (1986) and Washington v. Texas, 388 U.S. 14, 19, 23 (1976). Of course, there is not a better defense than proof that the crime was committed by someone other than the accused. In New York, the Court of Appeals has held that a court should admit evidence of third party culpability provided the proof is relevant and its probative value is not outweighed by undue prejudice to the opposing party, undue delay, or a danger of confusing the jury. See People v. Primo, 96 N.Y.2d 351 (2001) and People v. Oxley, 64 A.D.3d 1078 (3d Dept. 2009). Here, we have evidence that Stacey Stewart socialized with Michele Harris, was sexually involved with her, lived only a few miles from her, was with Michele at a bar around midnight of September 11 into the 12th, 2001, was seen with Michele Harris at the foot of her driveway around 6:00 a.m. on September 12th, and that he and Christopher Thomason burned bloody clothing, at least some of which we can now confirm belong to a woman, in Stewart’s burn pit on September 12, 2001. The evidence, when taken as a whole, is persuasive, raises serious questions about the thoroughness and propriety of the police investigation and undoubtedly creates a reasonable doubt about Mr. Harris’ guilt. If a jury hears this evidence, as the defense submits it should, Mr. Harris will be acquitted. Harris will be acquitted. Its probative value is that strong. Mr. Harris is charged with Murder in the Second Degree, pursuant to New York State Penal Law §125.25(1), for allegedly killing his estranged wife, Michele Harris, in the late evening of September 11, 2001, in their marital home, while their four young children were sleeping upstairs. Although this is Mr. Harris’s fourth trial on these charges, and the prosecution has relentlessly searched and surveilled Mr. Harris and his property over the past fifteen years, Michele’s body has never been found. There were no eyewitnesses to the alleged homicide. No weapon was ever recovered. Instead, the prosecution’s case was, and still is, built entirely on Mr. Harris’s alleged motive for the crime and the discovery of a minute quantity of blood – whose age could not be determined – in the kitchen and garage of the Harris home. According to prosecution witnesses, Michele went to work on the afternoon of September 11, 2001, and then drove to the apartment of Brian Early (one of the men she was sexually involved with at that time). According to Mr. Early, who did not know Michele was also seeing other men, she left him at about 11:00 or 11:15. Without any additional evidence, the prosecution theorized that Michele went directly home after leaving Early’s house, arriving around 11:30 p.m. Once there, according to the prosecution, she parked her minivan in the garage, and was then murdered by Mr. Harris as soon as she entered the kitchen through the garage door. The prosecution then alleges that Mr. Harris had the rest of the night, which he would have needed, to dispose of Michele’s body so that it would never be found, attempt to thoroughly clean his kitchen, move Michele’s van to the street at the bottom of the long driveway so that it would appear that she did not come into the house that night, clean himself up, and then call the babysitter, Barb Thayer, at approximately 7 a.m., to come watch the kids, so that she would find Michele’s minivan. This theory is built on the premise -- with virtually no proof -- that Michele entered the Harris home around 11:30 on the evening of September 11, 2001. Leaving aside the paucity of proof that Mr. Harris murdered Michele, the prosecution’s theory would utterly collapse under proof that Michele did not go straight home after leaving Brian Early’s apartment or showing that she was still alive the next morning. And that is the proof the defense now proffers. The defense maintains that Michele never entered the Harris house on the evening of September 11, 2001, and that she disappeared sometime between the time she left Early’s house and the time her minivan was discovered by Thayer at approximately 7:30 the next morning. Further, the defense has evidence -- which we believe that the jury should hear -- that Michele went out to a bar after leaving Brian Early’s, where she met up with Stacy Stewart and Christopher Thomason. 1 The defense is not presenting all of the evidence it has gathered. Rather, we are presenting the evidence we believe sufficient to make the relevance showing under Primo. If the application is granted, we will comply with all of our discovery obligations, as we have up to this point. With this showing and the discovery packet we will be sending out early next week, we will be up to date in meeting those obligations. We hope to have further evidence in the weeks to come. Pursuant to CPL 240.30, as soon as evidence we intend on introducing becomes available, we will promptly disclose it to the prosecution. By way of background, Stacy Stewart and Christopher Thomason are two men from Texas who came to the Tioga area in 2001 to work as steelworkers for a local manufacturer, Vulcraft. They initially stayed at a hotel about half a mile from Lefty’s, the bar and grill where Michele Harris worked. According to multiple sources, the men met Michele when she waited their table on a number of occasions, and then they began to socialize with her and her friends when she was not working. In August of 2001, Stewart bought a home in Lockwood, NY, about seven miles from the Harris residence. Within a few months of her disappearance, Stewart and Thomason abruptly left the NY area, without giving notice at work, and returned to Texas. Stewart never sought to sell his home, and simply abandoned it when he left, without paying the mortgage. It remains a small cabin adjacent to several small ponds, and it backs up to a large undeveloped and unoccupied wooded area with powerlines cutting through. The property has an outdoor fire pit, which Stewart used, but the subsequent owners rarely did. The current owner has been cooperative with investigators, allowing multiple searches, including one this past January which will be discussed further below. Stewart, up until recently, was a correction officer in the state of Texas; but, according to one source, lost his job because of multiple incidents where he abused inmates.2 Thomason is currently incarcerated in Texas for a probation violation following his conviction for a DWI related accident, in which another person was seriously hurt. He is expected to be released in May of his year. The PEOPLE of the State of New York, Respondent, v. Kenrick PRIMO, Appellant. Have only had time to skim this. SCHOHARIE, N.Y. (WBNG) -- It was announced Tuesday that a key witness has not been found and will not testify in the fourth murder trial of Cal Harris. Stacey Stewart is believed to be somewhere in Florida. Other witnesses have testified the two men knew Michele and socialized with her around the time of her disappearance. The defense says it will rest it's case Wednesday after calling three witnesses. Closing arguments are scheduled for next Wednesday, May 18. The judge is giving the attorneys extra time to work on closing arguments, attorney says those will most likely take place next Wednesday. With the constant objections, we're not making significant headway today. It wouldn't surprise me if Shultz returns tomorrow. The witness has been sent out and brought back into the room several times while the attorneys argue about what questions can be asked. Daniel Goodwin has returned to testify. He was the defense's photography expert who testified during the blood stain photos hearing. Honick owns property is Spencer near the Harris'. He testified about how he hunts there and in the surrounding areas. Day 23 of the #CalHarrisTrial has begun. Dave Honick is the first witness to take the stand. The defense in the fourth Cal Harris trial was expected to rest its case today, but they decided they weren't finished yet. The defense had called all their witnesses -- other than a few who refused to appear, including Stacy Stewart -- but right before the defense was going to rest its case, defense lawyers told the judge they weren't able to get some evidence on the record previously and have decided to recall four New York State Police investigators. Harris' defense attorneys have said their main objectives during this trial are to show reasonable doubt, but also prove other men may be responsible for Michele Harris' death, those men being Stacy Stewart and Chris Thomason. The defense called dozens of witnesses to the stand; some knew Stewart and Thomason personally while other witnesses were police investigators who interviewed them. Defense attorney Bruce Barket said it's striking, the information these witnesses know or have heard -- yet the judge would not allow most of it to come into the record, as it was classified as hearsay. While much of the specific information gathered by New York State Police investigators was not permitted in court, Barket says it's clear there were many leads given to police that were not sufficiently followed up on. Jessica Hunsinger testified Wednesday. She says she worked with Stewart and Thomason back in 2001. Hunsinger says she told police about an occasion when she was four-wheeling with Stewart when they stopped at a small pond, and Stewart asked her a bizarre question about the color of the water. The defense argues the NYSP searched the wrong pond if they were basing their search on Hunsinger's statement. Two master's students who were involved in the excavation of the burn pit on Stewart's former Lockwood property also took the stand. They testified about retrieving several items from the pit, including pieces of fabric, a coin, a button, a key, a knife blade and a bra strap. The judge ruled against allowing any of those items into evidence, except for the bra strap. That item is still being considered. The defense told the judge today that they feel he is "carving up" their third-person culpability case by only allowing bits and pieces of evidence in. The defense will recall those investigators to the stand tomorrow morning. The prosecution is expected to begin presenting rebuttal witnesses tomorrow afternoon. Closing arguments are still expected to take place Wednesday of next week. It's unclear when the judge will render a decision after that. Court has recessed for the day. More arguments will be heard tomorrow and prosecution rebuttal witnesses will be called. Bruce Barket and Cal Harris' defense team rested their case just after Judge Richard Mott ruled several pieces of testimony inadmissible, and also denied allowing into evidence a bra strap found in a Tioga County burn pit previously owned by Stacey Stewart. SCHOHARIE (WBNG Binghamton)—Closing arguments in the fourth Cal Harris murder trial are scheduled for Wednesday, May 18 at 10 a.m.
Testimony has gone on for 26 court days so far in Schoharie, with the last day scheduled for Tuesday, May 17. After 27 days of testimony in the fourth Cal Harris murder trial, closing arguments are set to be delivered Wednesday before the judge who will decide the Spencer man's fate. The closing arguments in Schoharie County Court will center on what each side believes the evidence proves — and what it does not. Tioga County District Attorney Kirk Martin says Cal Harris murdered his estranged wife, Michele Harris, late at night on Sept. 11, 2001, as a means of keeping control of his wealth and his family amid their divorce proceeding. Although Michele's body has never been found, Martin contends millimeter-sized blood spatter stains in the kitchen alcove and garage floor of the Harris home that contain her DNA are strong circumstantial proof the 35-year-old mother of four was killed there. Defense lawyer Bruce Barket has argued none of those bloodstains add up to the scene of a violent assault, nor do they show signs of a clean up, which is what prosecutors allege Cal Harris did as part of his efforts to conceal the crime. The stains were found during a state police forensic search of the Harris home several days after Michele Harris disappeared. SCHOHARIE, N.Y. (WBNG) -- Closing arguments are being pushed back in the fourth Cal Harris murder trial. Judge Richard Mott made a major ruling Tuesday afternoon and it had the defense up in arms. Judge Mott allowed the time sheets from Stacey Stewart the week of September 12, 2001 to be allowed into evidence. Stewart is one of the men the defense said is responsible for Michele's disappearance. The time sheets show that Stewart was at work the morning of September 12 at 6 a.m. The key witness for the defense, Kevin Tubbs, previously testified he saw Stewart with a woman who looked like Michele Harris at the end of the Harris driveway that morning at 6:30. Judge Mott allowed the records in to show Stewart's work schedule and what hours he was paid for. The defense immediately erupted after the ruling, stating the prosecution failed to prove the time sheets were factual. That's when Judge Mott fired back saying "have your rebuttal witness here tomorrow at 10 a.m. or live with my ruling." The defense will call one rebuttal witness Wednesday who worked with Stewart to show the time sheets were inaccurate. It was a brief day in Schoharie County Court for the Cal Harris trial. On Tuesday, the prosecution finished their rebuttal case after reading in two testimonies from neighbors who lived near the Harris home. They refuted the defense's claims, saying they did not see anyone at the end of the Harris driveway in the early morning hours of September 12. They also never remember seeing any hay wagons drive by that morning. The defense initially told the court they did not have any sur-rebuttal witnesses, until the judge ruled that a time sheet that was conditionally entered into evidence last week was allowed in. The judge said the time sheet was only allowed in to show Stacy Stewart's scheduled hours, not whether or not he was at work the morning of September 12th. The defense objected and said they changed their mind, now wanting to call in another witness. That witness is scheduled to testify Wednesday morning. Closing arguments will follow. TWC News will air and stream the closings in their entirety. Not a TWC subscriber? Download our app to watch the stream of the closing arguments. Michael Myers, the State Police investigator who interviewed Stacey Stewart in October 2001, testified Friday that Stewart denied seeing Michele Harris outside of Lefty's, where she worked. Myers also testified that Stewart was cooperative, but the investigator admitted under cross-examination that he didn't take many notes of the conversation with Stewart. The defense is trying to point to Stewart as a possible alternative suspect in Michele Harris' disappearance. Myers said State Police didn't install the same tracking or surveillance devices to keep track of Stewart, like they did for Cal Harris. Two neighbors near the Harris home, serving as prosecution rebuttal witnesses, testified they didn't see any farmers, hay wagons or trucks in the fields near the Harris property on the morning of September 12, 2001. Kevin Tubbs has testifed that he saw Michele Harris at the bottom of the Harris driveway. Prosecutors are expected to call another rebuttal witness Tuesday in an attempt to provide an alibi for Stacey Stewart, who they contend was at work at 6 a.m. on September 12. Judge Richard Mott will begin his deliberations beginning tomorrow. He told the court he will provide a 30-minute notice before reading his verdict in court. As Kirk Martin finished his closing argument, Cal Harris' motive played a large role in his conclusion, including how the nine months of divorce settlement talks differed from how Bruce Barket said they went just hours before. Tioga County District Attorney Kirk Martin opened his closing argument Wednesday afternoon in the Cal Harris murder trial dissecting the testimony of Kevin Tubbs, the viability of Stacey Stewart as a suspect and the morning hours of September 12, 2001. Martin said Harris was the only one with a real motive to kill his estranged wife Michele Harris. The two were going through a divorce and were not, in fact, close to a divorce settlement. And, Martin argued, the two were millions apart in evaluating Cal Harris' net worth, which would impact the settlement amount. Martin also said with Michele out of the picture, Cal Harris would retain custody of their four young children. "We acknowledge he found a good spot [to hide the body]," Martin said. Bruce Barket spent the second half of his closing pointing to a second person of interest in the case -- Stacy Stewart -- who witness Kevin Tubbs claimed to have seen arguing with Michele in the Harris' driveway on September 12, 2001. "As lawyers we know wrongful convictions all the time. Almost a day doesn't go by without a report of an innocent person spending decades in prison for a crime that somebody else committed. Cal knows full well that it could happen to him, because for the last 15 years he has endured the burden of a false accusation of murder," Barket said. The prosecution will give its closing this afternoon. In his closing argument, defense attorney Bruce Barket focused on stains found in the Harris home, arguing they weren't those of a "violent assault." Barket pointed to divorce settlement talks that were moving forward, contrary to what the prosecution has argued. At 9:30 a.m. it was announced that there would not be a final witness this morning, meaning that closing arguments will start shortly after 10 a.m. The latest Cal Harris trial is near its end as closing arguments are scheduled to begin today. Camille DeLongis provides a lookback here. The defense is expected to call one final witness this morning and closings will follow. Tomorrow #MottWatch resumes for #CalHarrisTrial ... so stay tuned! In September 2001, 35-year-old mother of four Michele Harris disappeared. On Tuesday, a judge declared her husband, Cal Harris, not guilty of her murder. ...Tuesday's verdict by Judge Richard Mott brings an end to Cal Harris' fourth murder trial — and to the Spencer man's nearly decade-long quest to prove his innocence. But it brings no closure to the family of Michele Harris, whose body has never been found. ...Mott delivered his verdict to the packed courtroom with no explanation of his decision, which he reached after some 12 hours of deliberation. ".....A New York man who lost millions defending himself four times against accusations that he murdered his wife is finally able to walk free after 15 years. Calvin 'Cal' Harris's wife, Michele, then 35, vanished from their home on September 11, 2001. She and Harris, who was then 38 and worth $4million, were going through a divorce - and cops said he murdered her to keep his money. He underwent four trials between 2005 and today, each one ultimately collapsing. Now, finally, Harris is free - with a fraction of his former wealth....."
And he began to cry as he recounted how he had been 'robbed' of his 'right as a father' to raise his children. He added that although it was now over, the 15-year ordeal, which he called a 'horrible abuse of power,' had taken its toll on his entire family. 'We can now finally move forward and make plans in our lives as normal people do,' he said. And Harris's lawyer, Bruce Barkett, said that he was determined to make hold responsible for his client's repeated trials accountable. 'The people that hunted Cal Harris for 15 years - today, the hunted become the prey,' he warned....."
Somehow I knew that Cal Harris was going to be acquitted, the defense apparently took a gamble by going for a bench trial instead of a jury trial, but there was already a precedent. Two murder convictions were overturned on appeal, the court of appeals judges disagreed with the jury decisions in two previous criminal trials, and the jury was deadlocked in the third criminal trail which ended up in a mistrial. Apparently there wasn't enough evidence to find him guilty of murder, though the suspicion was always there. I agree that there is no reason for celebration, the children lost their mother and have been through an unbelievable ordeal for the last 15 years. I wonder if there will ever be closure for the Harris children. Thank you to CP and to Freckles for the updates. AD: You're welcome; and thank you for all your updates! "....A New York man who has tried for the murder of his wife on four separate occasions was arrested on Thursday following a confrontation with a cop. Calvin Harris, 55, was charged with fourth-degree stalking after he allegedly threatened a state police investigator and his family outside their home in Oneonta. He claimed on Friday however that he was walking down the street and minding his own business when the officer confronted him and asked where he buried the body of his wife. Harris did not explain however what he was doing in the town, which is located 75 miles away from where he lives in Spencer. ...."
(WBNG) -- Cal Harris, 55, of Spencer, is making headlines again. Less than three weeks after he was found not guilty of slaying his wife 15 years ago, he's been charged with stalking one of the state police investigators involved in his case. Harris said he was in Oneonta to meet someone interested in buying a drone from him online and said he didn't know Investigator Schultz lived at that address. Harris said he thinks he may have been "set up" by NYSP Troop C. During the news conference, Harris said his vehicle's dash camera captured the whole interaction, but it was confiscated by state police. He said he also recorded part of the exchange with Schulz on his cell phone, which was also taken by state police. According to the New York State Police news release sent Friday, Town of Oneonta Judge Ferrell ordered Harris to surrender all firearms in his possession on Thursday. When Action News asked Harris about the firearms on Friday, Harris said he carried only a pellet pistol in his vehicle, because he has received death threats. Harris said he would not want to use the pistol, but only "show it" if he had to. Did he get set up? Is he out for vengeance? Does he really want to continue with the legal games? Does he have no future plans and is set on going to prison?? He should have been taking a breather with his children... just kicking back and enjoying what he does have left of his life. Listen to some music, watch some movies, go for a drive...adopt a dog!